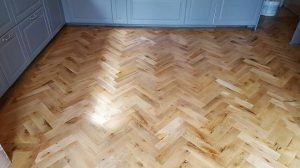 Are you looking for a professional and affordable wood floor sanding company in London? Sanding is the first and crucial step before one can stain or finish a floor. If the sanding is not done correctly the floor will not look good later on regardless of the finish or stain used. The result of the sanding process should be an entirely smooth surface. Sanding a floor is really hard work, requires knowledge and is very messy as it generates a great deal of fine sawdust. For these reasons it is important to use a professional rather than attempting to do it oneself. The London based experts at FK Floor Sanding use their skills and experience to ensure that the sanded surface is smooth and ready for whatever the next step may be. The highly specialised, dust-free equipment we use means that we carry out the job quickly and cleanly. Our craftsmen follow a process in order to obtain a perfectly smooth floor. Taking into consideration all of these factors, you know that booking our company is definitely a solid choice. The first step is to carefully check the floor for protruding nails or other objects in the floor. We remove them so that they are flush with the floor surface. Our teams also assess the state of the floor so they know exactly how much sanding to do to obtain the desired result. The first sanding, especially with floors that are not in good condition, involves using a coarse abrasive. If floors are covered in paint or are badly scratched, gouged or stained, they will require a much tougher and deeper initial sanding. Once we remove the paint, old varnish and marks the wood will be a little rough. It’s therefore necessary to continue sanding. The grit level used to sand a wood floor becomes increasingly fine during the process so as not to damage the floor. Each time a sanding level has been completed the floor is carefully and thoroughly cleaned. This is to ensure that no debris remains on the surface that could cause scratching. It’s astonishing how much damage a bit of grit can do to a wood floor when a sanding machine goes over it or picks it up! While we do use dust-free sanding machines there may be some sawdust that drifts around. The other consequence of the sanding process is that the equipment does make a noise. It may be wise to remove pets from domestic premises. Perhaps neighbours – especially if one lives in an apartment – should know in advance for the sake of good relations! For further information about our quality wood floor sanding in London or to book an appointment to have wooden floors assessed, please call us on 020 3909 7641. Our team members will be more than happy to assist you. Click here to view our prices.